One of a couple’s first and most important choices to make, once they have conceived, is in choosing their care provider. All providers of prenatal and childbirth care are not equal. Before heading off to the first person found on the internet, a couple should understand that they have a choice. A choice not only of which particular provider but of which type of provider. Prenatal and childbirth care is commonly administered by Obstetricians but Midwives and Family Practice doctors also deliver babies. Another important piece of information is that these providers typically work in only one or maybe two different hospitals or other birthing sites. This means that sometimes the best way to choose a provider is by choosing the place for the delivery – hospital, birth center or home birth. Midwives are as old as birth. Women have attended other women in labor since the beginning of time. Over thousands of years, the apprentice-trained midwives have become medically-trained and licensed professionals. Midwives are the recognized experts in low-risk pregnancy, childbirth and gynecology. We identified more than 50 short-term, medium-term, and long-term outcomes that could be improved by care within the scope of midwifery; reduced maternal and neonatal mortality and morbidity, reduced stillbirth and preterm birth, decreased number of unnecessary interventions, and improved psychosocial and public health outcomes. Midwifery was associated with more efficient use of resources and improved outcomes when provided by midwives who were educated, trained, licensed, and regulated. Our findings support a system-level shift from maternal and newborn care focused on identification and treatment of pathology for the minority to skilled care for all. This change includes preventive and supportive care that works to strengthen women’s capabilities in the context of respectful relationships, is tailored to their needs, focuses on promotion of normal reproductive processes, and in which first-line management of complications and accessible emergency treatment are provided when needed. Midwifery is pivotal to this approach, which requires effective interdisciplinary teamwork and integration across facility and community settings. A video discussing this video series is found here. What is the difference between a Midwife and an Obstetrician? The difference is the way in which each profession views pregnancy and birth. Pregnancy and childbearing are usually normal physiological processes. Pregnancy and childbearing is a profound experience, which carries significant meaning to the woman, her family, and the community. Midwives are the most appropriate care providers to attend childbearing women. Midwifery care promotes, protects and supports women’s human, reproductive and ethical principles of justice, equity, and respect for human dignity. Midwifery care is holistic and continuous in nature, grounded in an understanding of the social, emotional, cultural, spiritual, psychological and physical experiences of women. Midwifery care is emancipatory as it protects and enhances the health and social status of women, and builds women’s self confidence in their ability to cope with childbirth. Midwifery care takes place in partnership with women, recognizing the right to self-determination, and is respectful, personalized, continuous and non-authoritarian. Ethical and competent midwifery care is informed and guided by formal and continuous education, scientific research and application of evidence. Obstetrician/Gynecologists and Family Practice doctors provide maternity care in the United States. A woman is more likely to encounter a Family Practice doctor delivering babies in more remote or rural areas where there are not many Obstetricians. Usually, Obstetricians perform Cesarean sections. Physicians attend about 90% of the births in the United states. The International Federation of Gynecology and Obstetrics has a vision that women of the world achieve the highest possible standards of physical, mental, reproductive and sexual health and well-being throughout their lives. A good vision. But the vision is focused on achieving health. This assumes that the woman is not generally healthy and the natural processes of her body including pregnancy and birth need to be ACHIEVED, that they don’t just happen. Overall, it seems to me that we should adopt the age-old philosophy of “If it ain’t broke, don’t fix it.” Women should look for a provider whose core philosophy of care begins with a normal healthy woman doing a normal healthy thing. For the most part, when women discover they are pregnant, they head off to their gynecologist who then becomes their obstetric provider. Many women do not really consider their provider’s philosophy at all. They assume that all obstetric providers follow a similar algorithm when delivering babies and even believe that there is no real skill or bias involved. Women typically have no understanding of the wide variances in obstetrical practice between providers and between hospitals, even hospitals in the same town. Generally, hospital practices are highly influenced by the providers working there. The hospital reflects the core philosophies of the providers within, despite edicts from hospital administration and national governing bodies. Cesarean section rates in American hospitals vary widely with no measurable explanation. Currently, in the United States, the lowest hospital cesarean rate is 7% and the highest is 70%. Prenatal care and childbirth would improve if women entered into pregnancy actively, choosing her pregnancy care provider with intention instead of letting it happen almost accidentally and then continuing with that provider even it becomes obvious that she is not going to receive the care she desires. Whenever possible, pregnant women should be encouraged to be consumers of their healthcare. Meeting with an Obstetrician or Midwife prior to receiving prenatal care is a VERY good idea. At the initial interview, the client and the provider are on equal footing. The conversation helps each of them to know if they will work well together and helps them to establish goals for her pregnancy and birth. A woman can have a few questions or very many. How do you promote wellness in pregnancy? Do you believe almost all women can give birth vaginally? 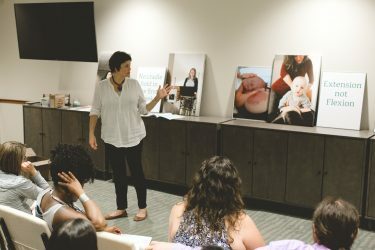 What childbirth classes do you recommend? How often do you induce labor? What are the common reasons labor is induced? Do you believe women benefit in any way from delivering their babies without pain medication or epidurals? How often do your clients deliver their babies without pain medication? Do you offer vaginal birth after cesarean to your patients? Do you believe VBAC is a good choice for most women who have had a cesarean? How often do you perform episiotomies, vacuum extractions or forceps deliveries? How often do you use Pitocin or break the bag of water to speed labor progress? Do the other providers in your practice share your philosophy and practice similarly to you? Do you attend your own deliveries or do physicians on staff at the hospital (hospitalists) often cover for you? OB/GYN physicians are rarely interviewed. It will be difficult to get an appointment to just talk without charge and without any medical care being administered. Many of these providers will avoid the discussion of labor management or just say what the woman wants to hear knowing full well that women in their hospital do not ever labor without an IV or without continuous fetal monitoring or many other routine interventions. Even a few minutes of conversation about childbirth can be very revealing. A woman should take notice of the provider’s body language, tone of voice and type of answers. Healthcare workers who help healthy women deliver their babies should be excited about the day the baby arrives. They should be very interested in discussing childbirth and not be defensive that the patient is asking questions. A provider should be able to maintain eye contact, stay closer to the woman than the door and even encourage more conversation by asking questions about her thoughts or concerns about childbirth. Even if the woman is pretty far into her pregnancy, she can choose to change providers or hospital and provider to be permitted the autonomy she is seeking for her birth. Do not be concerned about hurting their feelings. Transferring from one practice to another is not an uncommon occurrence in any obstetrical practice. Finding the right provider also hinges on finding the right hospital or birth center. Doctors and midwives must have the privilege to practice in a hospital so you may find a facility you like and then find out your doctor does not work there. This is the point where you might have to change providers even if you really like them because the hospital really does dictate many of the “freedoms” allowed a woman in her labor time. To avoid transferring out of your current practice late in your pregnancy, a couple should start touring hospitals right from the beginning of the pregnancy. A newly pregnant couple might be touring with a lot of women in their 3rd trimester but it is better for a woman to be a true consumer of healthcare by going early. Do women laboring in this facility typically remain on the fetal monitor for their whole labor? Can women eat and drink whatever they want in labor? Can women labor in the shower? In a tub? Do babies remain with their parents throughout the hospital stay? Is the hospital “baby friendly”? You should inquire about the hospital’s alternatives to intravenous and epidural pain medicine. Does the hospital have any birth balls? Large tubs for water immersion? TENS units? Some hospitals even staff labor doulas on their unit to give continuous labor support to women who request it. If the hospital does not have these things can you bring them in yourself? Would it be ok to rent a tub and bring it in? Can you use aromatherapy? The cesarean rates of every hospital in New Jersey and many other states are published on a site called www.cesareanrates.com. In a recent article in Consumer Reports, Biggest C-Section Risk May Be Your Hospital, stated that a woman’s risk for Cesarean could be up to nine times higher depending on the hospital that she chooses. Look at your local hospital c-section rates and let that be a guide in finding the right place to give birth. There will definitely be a different practice model in a hospital with a lower cesarean rate (Monmouth Medical Center 20.8%) as compared to one with a very high one (Hackensack Medical University Center 47.02%). Hospitals that staff Midwives and Lactation consultants, allow waterbirth and/or have the Baby Friendly Designation are more likely to have lower cesarean rates, be more patient-centric and feel less like “conveyor belt” care. Friends, co-workers and family can often give good referrals for providers and facilities. If they were happy and felt they received good care from their provider and their hospital, that is a good place to begin looking. A mother should not rush her decision about Provider or place of birth and she can always change her mind and make a change to something that suits her needs better.